Finally, some warmth and sunshine! It's starting to feeling like the summer season here in Friday Harbor, and not just because all the tourists have been arriving. The weather is finally catching up to the calendar and it's nice enough to go for walks without a jacket or sweatshirt on a daily basis for the first time this year - it's awesome! One afternoon last week I went down to American Camp for a walk in mid-afternoon, and because of the time of day it was pretty quiet. I did see a flycatcher that didn't match any of our most common species, and while it was unfortunately silent (flycatchers are easiest to identify by call), I did get the chance to get a photo of it. It wasn't a great shot, but with the input of several other birders, I'm fairly confident in calling in a western wood-pewee (182). There's a nice six mile route to bike leaving from my house, and with the nice weather I rode it on both Saturday and Sunday. I was amazed at the number of bird species I was able to see/here just while bike riding! On Saturday I counted 28 species on my evening ride, then during the afternoon on Sunday I counted 20, including some different ones from the day before. Some highlights included violet-green, barn, and northern-rough winged swallows; olive-sided and Pacific-slope flycatchers; house finches, purple finches, and American goldfinches; California quail; orange-crowned warblers; and a Bewick's wren. There have still been a few jellyfish around, though not nearly in the numbers as last week. I contacted a local jellyfish expert, Claudia Mills, who confirmed my IDs from my last post, although she explained that there are likely many more gregarious jellyfish (Phialidium gregarium) than aggregating jellyfish (Eutonia indicans). The former tend to outnumber the latter locally, so I'm sure there were lots of the gregarious jellies with a few aggregating jellies mixed in rather than being all aggregating as I had written. It was interesting to learn that such congregations of tiny jellyfish are typical in the spring, though this year the "invasion" was about three weeks later than normal. Other interesting sightings continue to happen from the marina, as well. Last night there was a school of fish hanging out here, which I wouldn't hesitate to call the biggest I've ever seen. The fish were small, and densely packed together, and the school was HUGE. I wonder if there could have been a million fish there? I wonder what kind they were? Unfortunately it was getting too dark to get a very good look. Most people erroneously call these sea otters, but sea otters were locally extirpated from the region during the fur trade. These otters are fairly common here and do swim in the sea, but they are actually river otters. There has been a sea otter population re-established on the outer coast of the Olympic Peninsula, and perhaps one day they will re-expand their range into the Salish Sea. Several years ago (2005?) 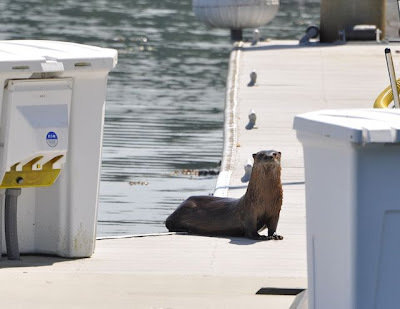 there were actually several sea otter sightings here, including one off Lime Kiln Lighthouse that I was able to photograph, but for now it's still same to assume that most if not all otters seen here are river otters. 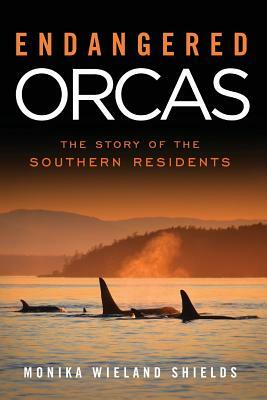 Finally, word just came tonight that many resident orcas are inbound in the Strait of Juan de Fuca! L-Pod did blow right out west as suspected after our last whale report, and no resident orcas have been seen in inland waters since then. Many, including yours truly, have been eagerly anticipating their return, and it sounds like tonight could be the night! Hopefully these whales - at least J and L Pod whales by the sounds of it - will stick around a while, and hopefully my next post will include some whale photos!